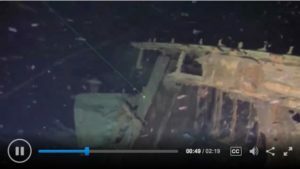 (CNN) – A South Korean firm has discovered a massive Russian warship at the bottom of the ocean more than a century after it sank. There is wild speculation it could carry a fortune in gold. And with that the mystery of the final resting place of the Russian warship Dmitrii Donskoy was solved in the deep dark waters off the South Korean island of Ulleungdo more than 1,400 feet down. The Russian Cyrillic letters revealed the final resting place of a ship that treasure hunters have been searching for for decades. Video footage from the salvage team showed the ship’s wheel, marine-growth incrusted guns and the anchor. The ship’s stern was severely damaged, the result of an attack by Japanese warships during the Russo-Japanese War of 1905. The ship was so badly damaged from that encounter that the captain had it deliberately sunk after evacuating almost 600 crew and soldiers to the nearby island of Ulleungdo. The Russians didn’t want the cargo to fall into Japanese hands because the ship was reportedly carrying large amounts gold. Some reports say the total amount of gold bars and coins on board would today be worth more than $130 billion. “All to pay for Russia’s war against Japan,” said Andrew Stevens, a CNN correspondent. But there are many treasure ship skeptics asking why would the Russians entrust so much loot onto one ship and why would they send it by ship when they could have sent it by rail across Russia to the eastern city of Vostok? The salvage company that found the ship said they plan to raise it, but they didn’t say when. They’ll have to fork over about a 10th of what they think the ship is worth, according to South Korean law. They are not commenting on the amount of gold.